The Stocking Merchant, Paul Sandby, 1759, collection unknown. The dress of this "merchant" suggests he's a sailor. Surrounded by ill-behaved subjects and holding his offerings at an angle that hides them from the legitimate hosiery to the left, there's a suggestion in this work that he is a nefarious type. His black hat is cocked at such an angle that it almost appears to be worn backward. There is a single button and loop on one side, and it has a low crown that might even be interpreted as flat. His curly and unkempt hair hangs loose from beneath his hat. The neckcloth is a striped pattern of light colors, tied in a large knot at the front. His short jacket is a light brown in hue with no lapels or collar. With narrowly spaced cloth-covered buttons, the jacket is single breasted and presumably without pockets, though the position of his arms makes it difficult to be sure. His slash cuffs have a remarkable number of buttons to them (eight on each cuff! ), but he hasn't bothered to actually close them. 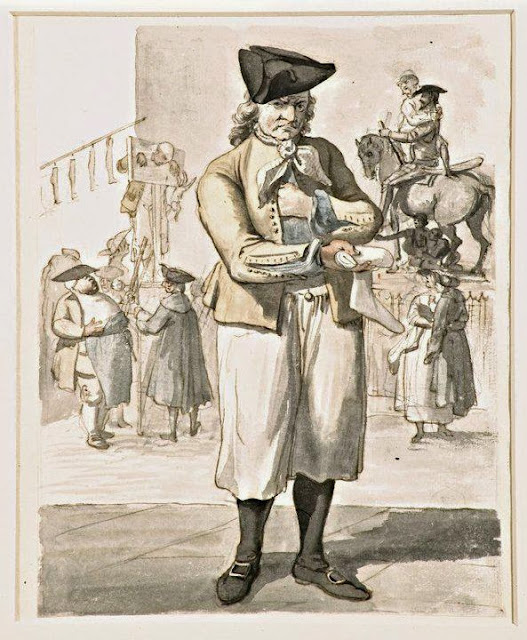 Without a waistcoat, the "merchant" wears a light blue shirt. This is an interesting inversion of the typical depiction of a sailor, who is almost universally depicted in a blue short jacket and some other color of shirt, most commonly white. The slops are a white with a single large button at the front. There does not appear to be any fly. They end below the knee at the top of the thigh, not unlike breeches. Slops were worn over the sailor's breeches, though it is rare to actually see those breeches in any period images. His stockings are black. which is likewise remarkable. Sailors are most often depicted with white or off-white stockings, and sometimes none at all. It could be implied that this man pilfered these, or acquired them with the rest of his stock. The shoes come to a rounded point, with slight heels. The buckle on the left looks squared, but that on the right is an oval. This could be a matter of perspective by the artist, or the subject may be wearing mismatched buckles.